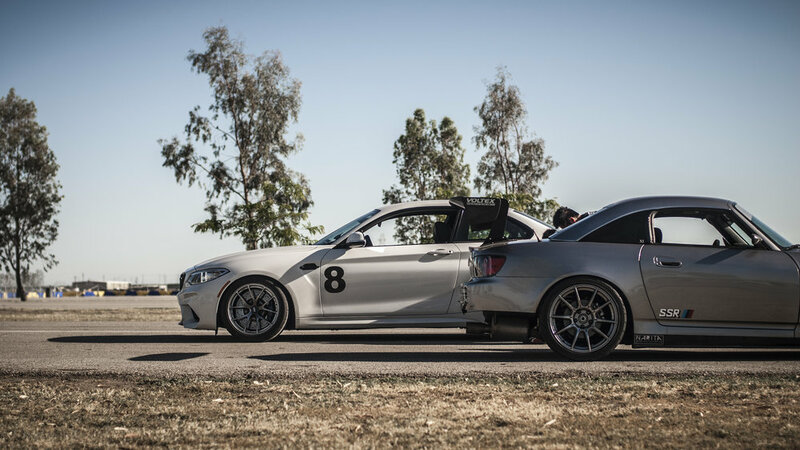 The team hasn't been to Buttonwillow Raceway in a really long time, since March 2016 to be specific. 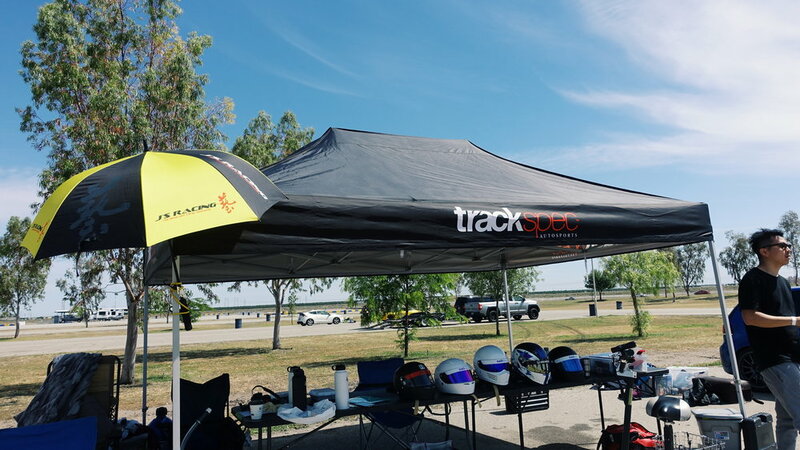 We also rarely do trackdays on a Sunday, but yesterday, May 14, 2017, was a great day with OnGrid. This event was special because it was the first time that our Trackspec Autosports Honda S2000 “Irene” was debuting after a complete refresh during the off-season. For those of you who remember, “Irene” arrived at our shop back in February after receiving a wicked new vinyl livery from the creative team at SS Customs. Since then, we worked to convert the car from ST3 trim to ST4; which meant a reduction in power output in order to meet the 12:1 power to weight ratio rule. We accomplished this by removing the supercharger so that “Irene” now has a naturally aspirated F2.2L with Supertech valvetrain, Brian Crower Stage 2 camshafts, Berk Technology header and exhaust, CT Engineering intake, and tuning by Jei Chang from Blacktrax Performance. While we were at it, we also fabricated a more efficient v-mounted oil cooler setup and intake feed system. “Irene” currently makes 225whp and 165 ft/lbs of torque (down from the 285whp and 205 ft/lbs allowed in ST3 last year). ST4 rules also mandate less aerodynamic aids. This meant that we needed to go back to an OEM AP2 front bumper and OEM fenders. We also removed the front canards, and we trimmed the front splitter down to only 4 inches. 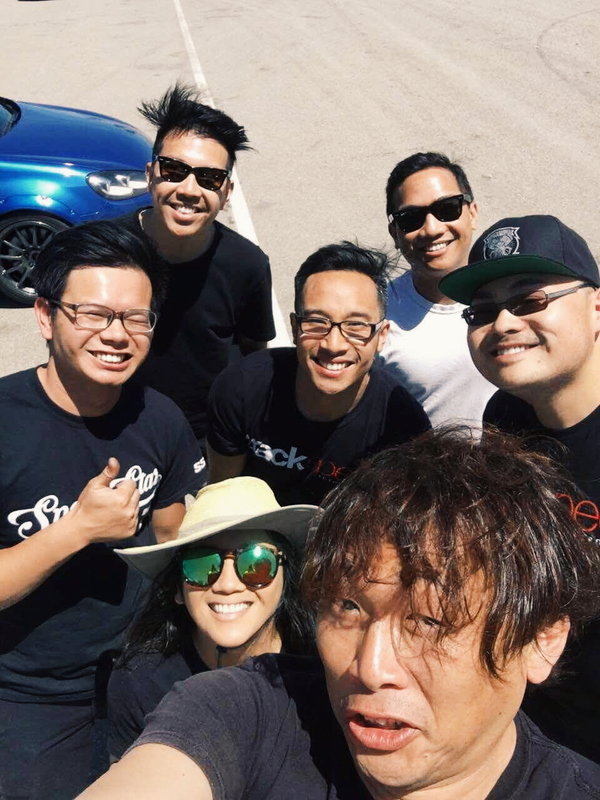 Our driver, Tom Tang, was excited to test all of these changes before Round 3 of the NASA NorCal Super Touring Championship (May 20-21 at Sonoma Raceway). In many ways, this would be like learning to drive the car all over again, but Tom was certainly up to the task. Unfortunately, the first session only lasted 1.5 laps when Tom braked into the “Sweeper” turn and was met with a cloud of smoke from the engine bay and the smell of burning engine oil. Good thing Tom has quick reflexes, because he was able to quickly pull the car off the track and onto an escape road between “Sweeper” and “Star Mazda” where he immediately shut off the engine. There, he evaluated whether or not his car was actually on fire or if what he was smelling was just burnt fluid. He made the executive decision to not activate his Safecraft halon fire system yet, and instead jumped out to take a look because it seemed that the smoke was actually subsiding. There was a ton of oil on the ground and it became apparent that the oil filter had somehow flown off while on track. The rescue team at Buttonwillow towed “Irene” back to our pit area on a flatbed and that’s when everyone jumped into action. Tom left with Mr. Hisaaki Murakami (President of J’s Racing), who was visiting from Japan (spoiler alert: you may be able to buy J’s Racing parts from us soon), to get a new oil filter and engine oil from the nearest auto parts store. Meanwhile, Son and Jon worked to clean up all of the oil and to make sure that nothing else was wrong. After firing up the car, the guys saw that oil pressure looked good, and the engine seemed to be in great shape still. Phew! Son then asked Tom to drive the car around the skid-pad for a bit in order to help get the oil off of the tires. After a few minutes, they saw more smoke coming from the engine bay again. This time, Son opened the hood and was met by flames! It turns out, there was residual oil trapped under the exhaust manifold’s heat shield (which contains fiberglass), and it had gotten hot enough to actually catch on fire. The guys reacted quickly and put the mostly contained fire out. Fortunately, no damage was done besides a rather toasted heat shield (which we threw away) and a small burnt wire (didn’t seem to impact the car’s performance at all). Nearly two hours later and after missing a session, Tom finally went back out on track and tentatively began to build up speed. He saw his lap-times drop as he got used to being in different gears with the revised power-band. He ended session #3 with a best time of 1:59.7. After lunch, he had recorded a 1:58.6. Tom knows that there is more time to be found in the car (and in him). But for now, we have some work to do on “Irene” before they head up to Sonoma next weekend! Jon didn't get a PB in his Golf R (currently at 2:02.8), but he wasn't doing bad and his car had zero issues. After a couple laps, he was consistently getting 2:03s and 2:04s. Unfortunately, he had technical difficulties with his SD card and didn't get footage. Son also had some success. He didn't get a PB (currently at 1:55), but he accomplished his goal of breaking sub 2s, going home with a 1:59. Andrew didn't have much luck with times but his car ran smooth the entire day. 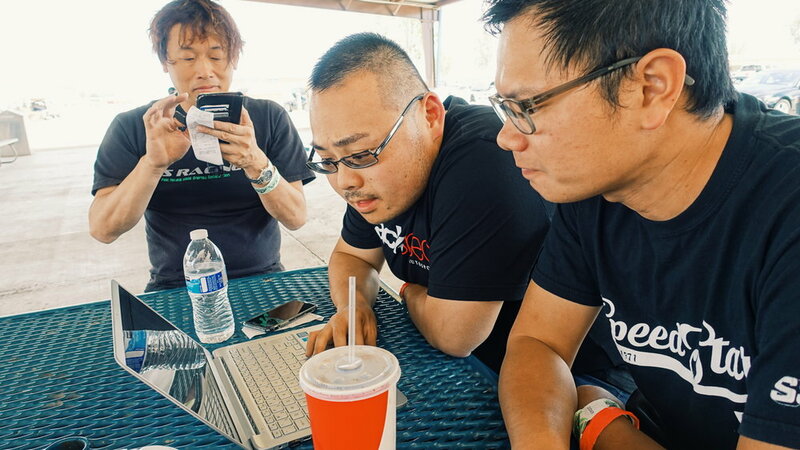 Thank you to Mr. Murakami for visiting all the way from Japan and taking care of our team members! Thank you to Jason Barnachea for coming from LA to take photos. And thanks to OnGrid for throwing another fun event!